At Electric Control Products, we listen to our customers feedback and act accordingly. Consequently we are continually introducing new materials into our production chain to better improve our product. At Electric Control Products, we listen to our customers feedback and act accordingly. Consequently we are continually introducing new materials into our production to improve our products. Below you will find information on our range of materials used in our safety switches, including: static dissipation polymer in PBT/PC, Safe-T-Lanyard STL-10-V, Safe-T-Lanyard STL-10-SS, positive break switches, electro polished stainless steel and PBT/PC (polybutylene/polycarbonate). Electric Control Products is proud to be one of the few manufacturers in Australia of static dissipation polymer safety switches, which can be utilised in Ex zones. Our static dissipative polymer is flame retardant to VO standard, UV stable, high impact and permanently dissipative. 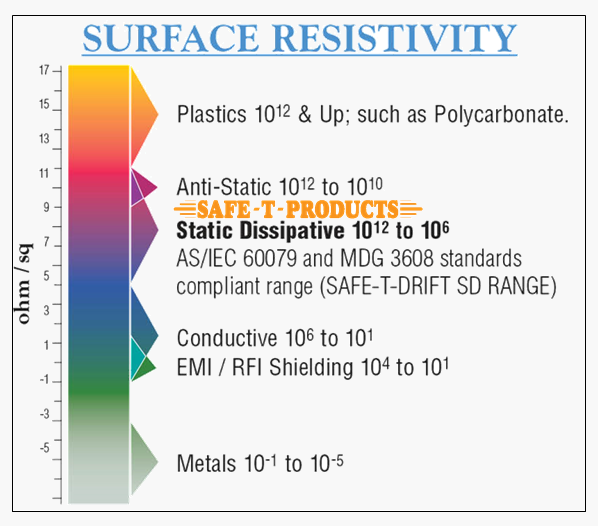 The surface resistivity test has been proven to be under 10^9Ω. It is also one of the first coloured static dissipative high impact materials in the world. Static dissipation polymer is utilised in areas requiring special precaution regarding ignition sources in potentially explosive atmospheres. Our switches have been tested and comply with the Anti-Static properties (Electrical Resistivity) requirements of New South Wales Mining Design Guidelines (MDG) 3608. The Safe-T-Drift heavy duty belt misalignment switch is made for applications requiring a unit which caters for high speed belt applications. Available in: PBT/PC, PBT/PC static dissipative and electro polished 2mm 316 stainless steel body. The Safe-T-Limit switch is made for situations requiring a positive break switch which caters for heavy duty applications. Available in: PBT/PC, PBT/PC static dissipative and electro polished 2mm 316 stainless steel body. The Safe-T-Rip heavy duty belt rip detector is magnetically or mechanically operated, utilising the inherent reliability of reed or micro switches. Available in: PBT/PC, PBT/PC static dissipative and electro polished 2mm 316 stainless steel body. STL-10-V is a UV stable red polyurethane coated LCP (liquid crystal polymer) 3mm (Inside Diameter) x 5mm (Outside Diameter) multifilament melt spun yarn. The STL-10-V is made to withstand the harsh environments the ropes are placed in, without the cover cracking or deteriorating. Our pull wires also comply with Machinery Standards AS 4024.1604-2006 Clause 5.4.6 Actuator Colour (The actuator of the emergency stop device SHALL be coloured red). The Safe-T-Lanyard is designed and manufactured for the purpose and use on Safe-T-Pull emergency stop pull wire system. STL-10-SS is a UV stable red polyurethane coated stainless steel 3mm (Inside Diameter) x 5mm (Outside Diameter) 6x19 construction wire rope. Positive opening or positive break is the term used for electrical switches using not just an over-centering spring force to open the normally closed contacts (snap action). But also a non-flexible mechanical operator that forces the contacts open. Safe-T-Products switch with positive break contacts performs to AS 60947.5.1/IEC 60947.5-1. To view a positive break micro switch electrical test, see: testing videos. The Collide-Safe switch is an IP67 rated Fail Safe Anti Collision Switch. Available in manual or self-resetting. The Pull-Safe pull wire switch comes in both manual and self-resetting and complies with the requirements of AS/NZS 3947.5.5/IEC 60947.5.5. The SSB range of safety switches are manufactured from 2 mm 316 electro polished stainless steel with a specially designed one piece seal for IP67 Rating. All external fittings are also 316 stainless steel. Many of our safety switches are manufactured with a PBT/PC enclosure. This product is UV stable, high impact, chemical resistant and flame retardant.